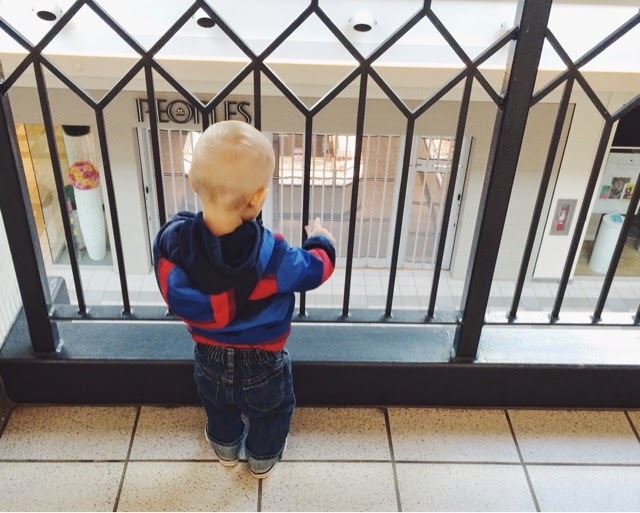 Sullivan and I went to the mall to ride the escalators the other day. He'd never really ridden one before - when we go to the mall he's usually in the stroller so we have to take the elevator in the Bay to get to the second level - so it was a pretty huge deal for him. A novelty. We got there at 8:30 am. The mall doors were open but the stores in the mall never open until 9:30 so the building was pretty empty, save for bleary-eyed mall employees heading to their respective shops, swinging key-heavy lanyards and clutching Starbucks cups. The escalators were all ours. Sullivan would grab my fingers and I'd swing him up onto the moving steps. He'd make all kinds of exclamations, pointing and laughing, and at the top I'd swing him off again. The baby equivalent of a carnival ride. We'd only been there for about fifteen minutes when we met the woman. She was a short, old lady with a heavy accent - I learned that she was from Manilla - and a very friendly smile. She asked what we were doing at the mall so early in the morning and I said that we were there to ride the escalators. She said she was there to walk as well - it was too windy outside - and to make friends. We were the only ones around, so I suppose we were It. We had nowhere we had to be, just the first floor and the second floor and the first floor again, so that was fine with me. She asked how old Sullivan was and what he liked to do besides ride escalators. I told her that he was one and that he really liked books and the swing at the park. I asked her how often she came to the mall and she said she came every morning, if it wasn't nice enough to walk outside. She asked where I was from originally and I told her I grew up on a farm in southern Saskatchewan. I asked her where she was from, and she smiled widely. She must have been itching to tell someone her story, because it fell right out of her. Like she was a stack of books sitting precariously on the edge of a desk and the question was a gentle nudge that knocked all of them onto the floor with a huge crash. "Manilla," she began. "I come from Manilla. I was like a queen in Manilla. I went to a nice school there and had a nice school bag and nice clothes. I always wore nice clothes. I met a man when I was young and we moved to Canada. It is too cold! So cold." She began to speak in the present tense even though she was telling a story that had to be roughly thirty years old. She punctuated her sentences by jabbing me in the arm and clutching at her scarf. We stepped onto the escalator; Sullivan was oblivious to everything except the ride. "We have two boys, my husband and I. We have two boys and my husband has a good job. Everything is okay, until my husband runs away. (I didn't know where he went then, but now I know that he went to Saudi Arabia!)" Here I got a very hard shoulder poke and she stared at me, a horrified expression on her face as though I had just now told her this news. "What do I do? What can I do? I have two little boys and no friends and no family and no money and I am in Canada and it is so cold! "I need to work. The government can help me a little, but it is not enough to feed my boys and have a house. I go to work, but I have no friends to watch my boys and I have no money to pay strangers to do it. I leave them at home, and I am afraid the house will burn down while I am away. Some days I can't even leave them lunch to eat while I am gone. I am afraid someone will take them away from me because I am not a good mother." We both looked down at Sullivan, who was swinging on my hands from the escalator onto the floor. I imagined with horror being in a strange country and having to leave him at home by himself so that I could work. I imagined having absolutely no options. "What can I do?" she said again. We re-boarded the escalator. There was a moment of silence before she broke into a broad smile and touched my arm. "I work hard, though. I work hard enough that I can afford a babysitter, and then a lawyer. He helps me to get money from my husband. I get a lot of money from my husband. He does not come back, but I have money, and so I think we will be okay. I take my boys to the store and buy them toys. They are so excited!" We reached the end of the ride and hopped off; Sullivan pulled me around the corner to the other escalator for a quick return trip and the woman followed closely at my heels. I hoped someone was watching our little trio from inside their closed shop. I thought we must look funny, me and the laughing toddler and the old lady who kept wringing her hands and touching my arm and gesticulating wildly. "They can eat and dress nicely and go to school, they grow up, they make friends. Their friends are always over at our house. They can go to college! They are both grown up, both engineers now. They know about science and computers and all that. One of my boys gets married! One of my boys has three cars! They buy me nice things now. They pay for me to live in a nice place where I don't even have to make my own meals. I wear nice clothes. I am like a queen again. Like I was in Manilla. And I come here and I make friends and it is so nice. We are all going to be okay." She touched my arm again, leaned forward and clutched my shoulder. "He is so cute, your boy. He reminds me of my babies. He will grow up very fast." And, with a smile but not a goodbye, the little old woman walked the rest of the way down the escalator and out the mall's front doors. And I realized that, for how much I did know about her, I did not know her name.